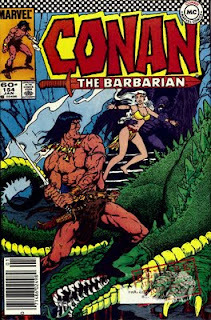 Now it’s time for a trip to Cimmeria, during the Hyborian Age, as we take a look at ‘Conan The Barbarian’ #154. Our Assistant Editor for this title is Jim Owsley, he was Larry Hama’s Assistant at the time. Owsley has had a long career as a writer and editor for the Marvel, DC and Acclaim comic companies. He was the first African-American writer and editor in comics, and became a Marvel editor at the age of 22, making him the youngest in the business. He was also one of the founders of Milestone Media. As for Conan #154, you’ll notice that the cover has a circle that says “MC” inside it. That's an homage/parody of the old "checkerboard" logo DC Comics used in the 1960s. 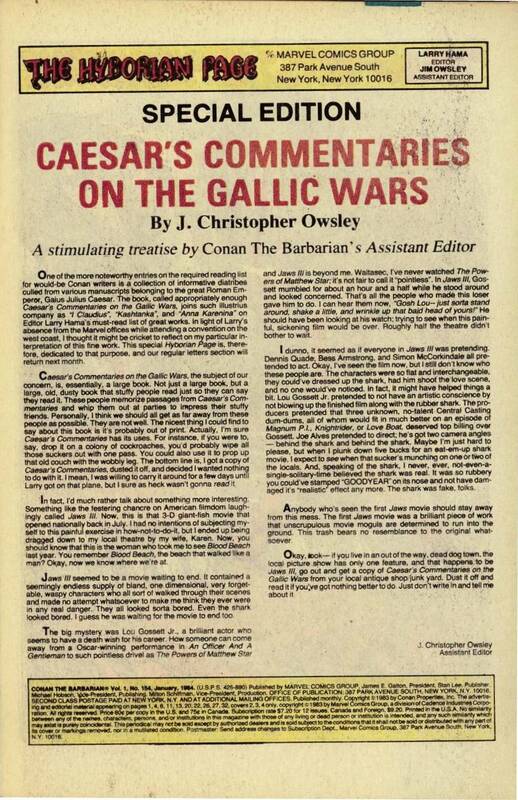 Inside, instead of a traditional splash page, we get a “Special Edition” of 'The Hyborian Page, Conan's letters page. 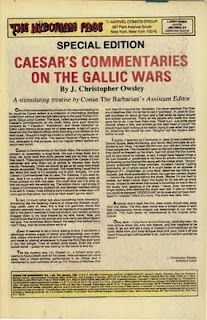 Owsley gives us an essay about ‘Caesar’s Commentary on the Gallic War’. By the third paragraph, he veers way off course and gives a funny review of ‘Jaws III’ (which was in theaters shortly before this issue was published). I’m not proud to admit that I saw ‘Jaws II’ in theaters, and I have to say that Owsley was correct here. Like the cover logo, the title is a reference to The Batman of Zur-En-Arrh, a Batman from another planet who first appeared during the Silver Age. I’ll admit that I’ve never been much of a Conan fan, only picked up a few issues here and there. 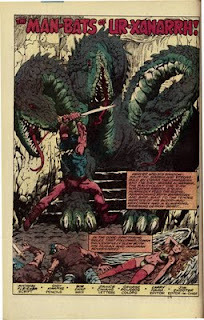 But besides the title, I don’t notice anything funny or odd about this issue, just a typical "Conan vs. Bad Guys story". If any Conan experts happen to read this, maybe they can point out “offbeat” stuff about this story. That's it for now, check back in a few days when AEM looks at fashions of 1983...and 1964. Very cool blog!! 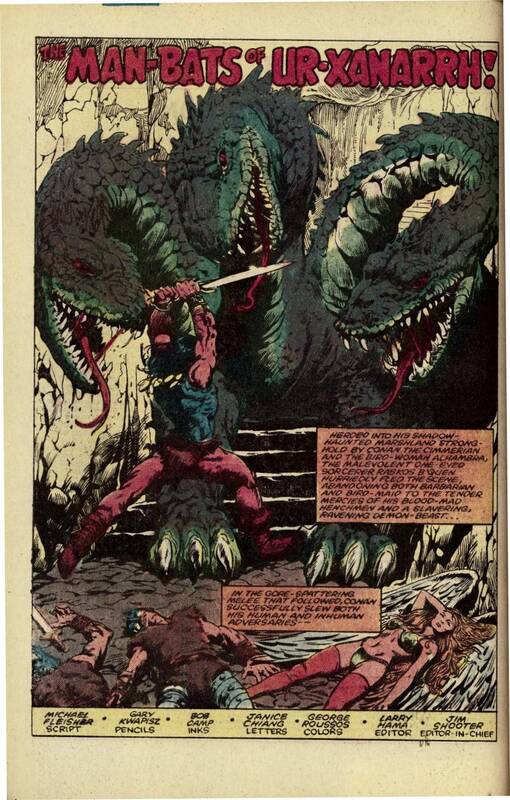 I'm a 80's Marvel comic fan, so this blog brings back some happy memories! Thanks! Thanks for stopping by, I should have a new post up by tomorrow. Would've been up already but I'm having problems with my scanner. Learn something new every day! We had no idea the Owsley stories we enjoyed in the 80s and the Black Panther/The Crew stories we enjoyed more recently were written by the same guy!